Want to know what the top ten toughest Driving Theory Test questions are? Practise for FREE with our quiz below! If you’re revising for your Driving Theory Test, you’ll know just how difficult some of the questions are. So here at Driving Test Success, we thought we’d delve into our data banks and work out what questions our Driving Theory Test 4 in 1 App users flagged as the most difficult. Our app experts soon came back with the results, and we thought that listing them here, with the answers, of course, would help everyone with their revision. 1 . When driving a car fitted with automatic transmission, what would you use ‘kick down’ for? 2. You're turning right onto a dual carriageway. What should you do before emerging? 3. What is a cover note? 4. For how long is a Statutory Off-Road Notification (SORN) valid? 5. You're waiting in a traffic queue at night. How can you avoid dazzling drivers behind you? 6. What must you have when you apply to renew your vehicle tax? 7. You've just passed these warning lights. What hazard would you expect to see next? 8. At a puffin crossing, which colour follows the green signal? 9. 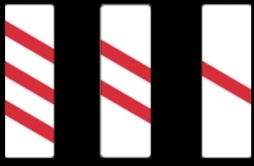 Where will you see these red and white markers? 10. Which vehicle will use a blue flashing beacon? Check by seeing the questions and answers below, including the full explanations as provided by the DVSA. 1. When driving a car fitted with automatic transmission, what would you use ‘kick down’ for? The explanation for this is that 'Kick down’ selects a lower gear, enabling the vehicle to accelerate faster. This question would be found in the ‘Hazard awareness’ category. Answer: Check that the central reservation is wide enough for your vehicle. The explanation for this is: Before emerging right onto a dual carriageway, make sure that the central reservation is deep enough to protect your vehicle. If it isn't, you should treat the dual carriageway as one road and check that it’s clear in both directions before pulling out. Neglecting to do this could place part or all of your vehicle in the path of approaching traffic and cause a collision. This question would be found in the ‘Alertness’ category. Answer: A document issued before you receive your insurance certificate. The explanation: Sometimes an insurance company will issue a temporary insurance certificate called a cover note. It gives you the same insurance cover as your certificate but lasts for a limited period, usually one month. This question is seen in the ‘Essential Documents’ category. Answer: Until the vehicle is taxed, sold or scrapped. The explanation behind the answer is: A SORN allows you to keep a vehicle off-road and untaxed. SORN will end when the vehicle is taxed, sold or scrapped. Answer: Use the parking brake only. The explanation behind this is: You can renew your vehicle tax online, at post offices and vehicle registration offices, or by phone. When applying, make sure you have all the relevant, valid documents, including a valid MOT test certificate where applicable. This is another question seen in the ‘Essential Documents’ category. Answer: A school crossing patrol. The explanation: These lights warn that children may be crossing the road to a nearby school. Slow down so that you’re ready to stop if necessary. We have a separate feature on the school crossing patrol hazard and don't forget to check out our hazard perception pages for more information. The explanation: Puffin crossings have infra-red sensors that detect when pedestrians are crossing and hold the red traffic signal until the crossing is clear. 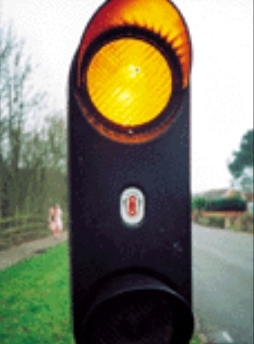 The use of a sensor means there's no flashing amber phase as there is with a pelican crossing. If you're confused by Light Controlled Crossings (Pelican, Puffin and Toucan), read our blog for the complete explanation! Answer: Approaching a concealed level crossing. Explanation: If there's a bend just before a level crossing, you may not be able to see the level-crossing barriers or waiting traffic. These signs give you an early warning that you may find these hazards just around the bend. Explanation: Emergency vehicles use blue flashing lights. If you see or hear one, move out of its way as soon as it's safe and legal to do so. So there you are; they are the top ten toughest Driving Theory Test questions and answers as found by our Driving Test Success 4 in 1 App users. Remember, if you’re serious about passing the Theory Test, you will have to put in the effort to revise both the multiple-choice test and the Hazard Perception test. Our Driving Theory Test 4 in 1 App has everything you’ll ever need including our exclusive Stopping Distance Simulator, along with all the very latest DVSA Theory Test revision materials.